Yeah… this is why I’m moving to San Francisco. This year’s Birdathon (a 24-hour species count to raise contributions for the Mass Audubon, specifically for the Great Meadows National Wildlife Refuge. We didn’t see much, and certainly not a King Rail, but we did see a few swans through the fog and darkness. Our Saturday began with a quick stop in North Andover for a Yellow-crowned Night Heron. This was the highlight of the day. Most of the rest of the day was spent on Plum Island at the Parker River National Wildlife Refuge, save a few minutes spent upgrading Elizabeth’s binoculars to a new pair (her old ones were completely overtaken by interior fogging). We did see a Snowy Owl on the island, but missed most of our regular (and irregular) birds there because of the conditions. Our day ended at Mount Auburn Cemetery. This is pretty hot: a holiday owl. The weather forecasters around here love to make dire predictions about the winter weather. They may be true for other parts of the state, but they’re almost always laughably wrong for where we live in Somerville. Yesterday, however, proved them right. The forecast was for 4-7″ of snow during the day, but they reduced that in the morning to 3-5″ and said that the high would be 35 degrees F. I, of course, was skeptical, as always. Boy was I wrong…. We ended up getting 6″ during the day and the visibility when I walked home from work was comically bad–probably less than 100 yards for most of the time. I would have frozen alive if the temperature had been any lower, as the winds were gusting about 25 mph. 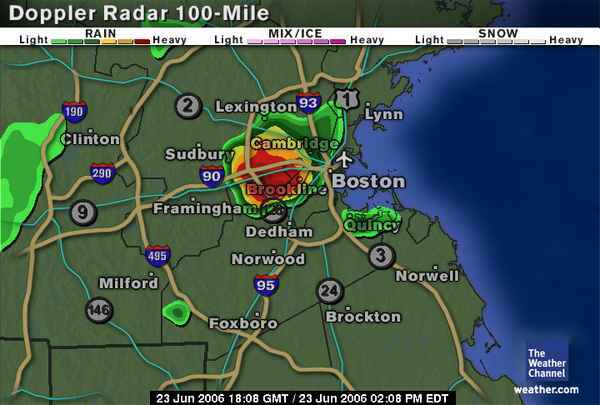 A Comair plane on its descent into Logan International Airport in Boston was struck by lightning Friday afternoon and made an emergency landing. None of the 32 passengers or 3 crew members on the flight were hurt. The plane, which suffered wing damage, was arriving from Baltimore. Logan Airport was later closed because of the weather, as were T. F. Green Airport in Providence and Hanscom Field in Bedford, Mass. Then, this morning, I got to clean off the Prius so that Elizabeth could go to her stained glass class at the MFA. That took 15 minutes of shovelling and another 10 minutes just to get the silly car out of the snowbank. Oh, how it made me long for my old Audi wagon with all-wheel-drive.